Your task is simple: Come up with the funniest possible caption for this image. Once you have your answer, post it on this thread or send it to us by email at competitions@jagex.com. Please include the word 'caption' in your subject header to help us spot your entry! If you are under 13, please ask a parent or guardian to email your entry to us on your behalf, from their contact email address. You can enter as many captions as you like. We read every single entry, so you will have the same chance of winning whether you post here or submit by email. The competition will close on Friday 22 July - so get your captions in as soon as you can. We will then go through all the entries and find the ones that get the best response from everyone here. Both winners will have their captions featured in the next newsletter. Noted; Not a good idea to take a picture of Jon H while he's holding dangerous objects. 299! How did I bowl a 299?!?! Mod Jon H is not amused by your silly little games. Max Quest Points. Max Cool Points. Host of the Immensely Popular Lords of the Wait. Who said men can't multitask? 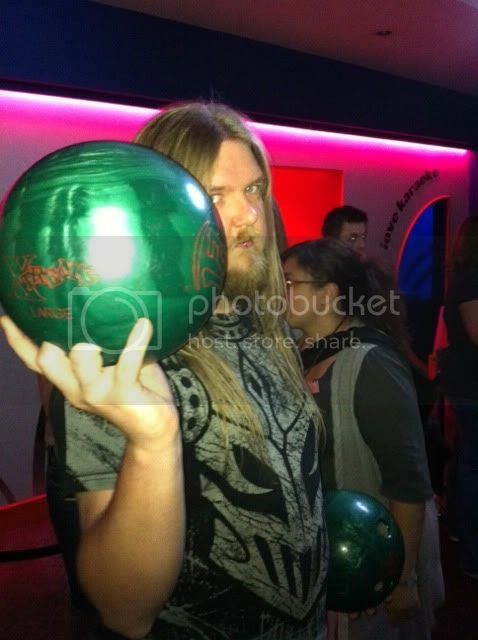 I'm doing a rockhand and playing bowling at the same time! What do you mean a 50 is bad? Bowling for Dummies: Don't hold the ball like this. Do I hold it like this? Why did they pick me to represent them? I'm not even part of Community Management! FOR THE LAST TIME! STOP THROWING THE GNOMEBALL! World of Warcraft can't rock like this. New runescape pet - the ten pin bowling ball! Who's a good pet? You're a good pet... OOWWWWWW! My Bowling level is 1337. Using basic dwarf magic, Jon cast an Earth Strike.